No.1 Roofing and Building Supplies carries a large range of the ModakBoard product. 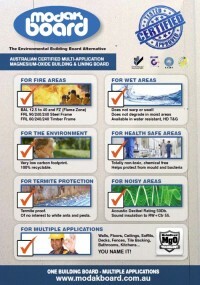 ModakBoard is a modern building board used extensively in construction. ModakBoard is made from a mixture of magnesium-oxide, non organic minerals, bonders and fibre mesh composites, and is completely free of toxins, including formaldehyde, silica, asbestos, heavy metals, and organic solvents. 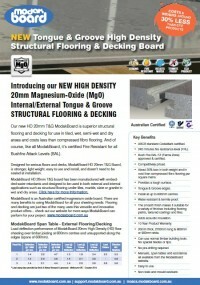 Please click on the ModakBoard brochures to know more.